This year the largest individual ALG project – SLM School Feeding - ensured that on a daily basis more than 900 tummies were full and not thirsty! Our large SLM School Feeding program provides a daily meal for the 908 students from Year 1 to Year 7 currently enrolled in the St. Luísa Marillac School (“SLM”), village of Manjangue, which is 20 km from Chokwé city. The free school meals have as key goals to incentivise school attendance, to improve child academic performance as well as to nurture their cognitive and motor development. In 2018, the project cost ALG c.£24.000 of full year financing. Together with the Vicentine Ssters our Local Partners in the school, we approved exciting upgrades that make a difference in the daily lives of our children. 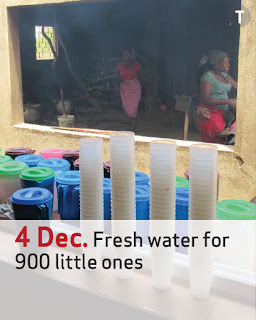 This year we acquired our first freezer to keep the menu produce fresh , a gigantic kitchen table to prepare hundreds of daily meals, but… the nicest upgrade was the colorfoul new jars and water glasses that allow the 900 children to have access to drinkable water at lunch time! 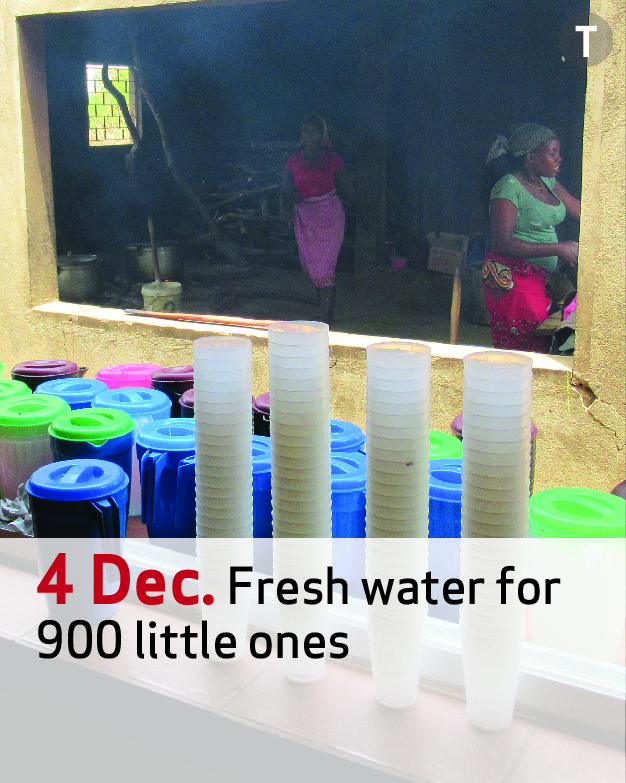 This water comes from the Sisters’ fresh water polytank that also benefited from some much-needed maintenance works late this year in order to guarantee better health& safety conditions. In 2018, lunch time started to be calmer as organised canteen queues started to be implemented better manage the entry and sitting-down periods. Besides the collaboration on the school teachers side, our volunteers on the ground had a fundamental role in the implementation of a more organized system to serve meals to such a large crowd of hungry children. With the collaboration of everyone and with team work, the SLM School Feeding programme ends 2018 with happier, more dignified and more complete lunches – with full plates and glasses!